If you're getting on in years, especially if you've sustained a back injury or two along the way, you may be prone to a condition known facet joint hypertrophy. Hypertrophy in your facet joints is related to spinal arthritis, and like spinal arthritis, it usually occurs as the effects of age, wear and tear, poor posture and/or injuries take root. Facet joints are synovial joints, which means they come complete with a surrounding capsule and an inner self-lubricating capacity. This type of structure enables a normal, healthy facet joint to glide easily and smoothly, and perhaps most importantly, pain free. But facet joints are prone to wear and tear, especially as we age. In fact, it's inevitable. While not all instances of wear and tear related degeneration will produce pain or other symptoms, degeneration does develop, at least to some extent, in anyone who gets old enough. And it can start young, too. So the good news is that painful facet joints are not a given, even if you live into your 90s and longer. That said, the risk for pain and physical limitation is decidedly there. Plus, there’s the potential for a “vicious cycle” of continual degeneration This may occur happen when wear and tear erodes the cushioning located between the two bony surfaces of the facet joint, eventually leaving you with bone on bone contact during spinal movement. As the two bony surfaces of the joint rub against one another, the area becomes inflammed. Inflammation of the facet joint may not only translate to pain, but may also stimulates new bone growth and bone spur development. This process has a number of names: Spondylosis, spinal arthritis, and facet joint syndrome. The new bone that is laid down in the case of facet joint syndrome may become larger than the original it replaces. Once this occurs, the condition moves from being called facet joint syndrome to facet joint hypertrophy. Either way, though, it's still called spondylosis, which is a term that refers to any type of degeneration in the spine, and/or spinal arthritis. 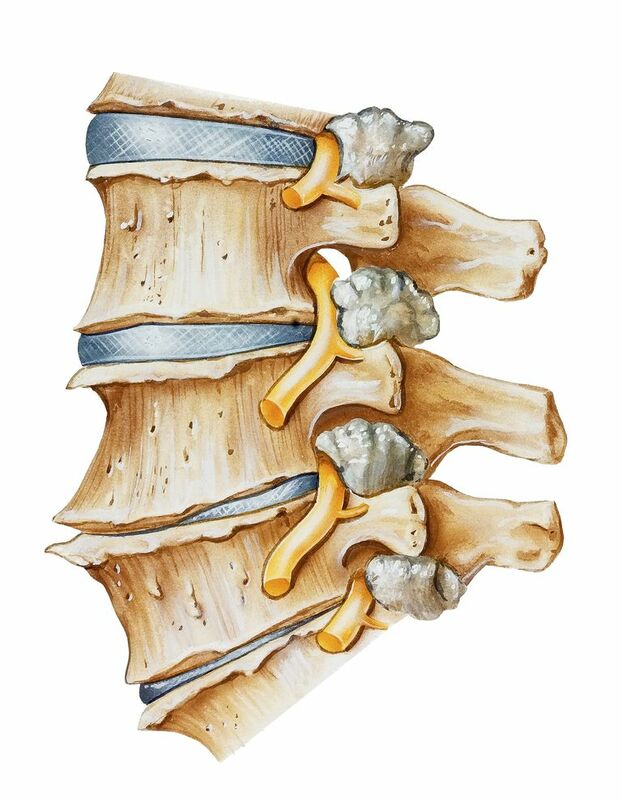 The facet joints are very close to the intervertebral foramina, which are the “holes” on either side of the spine through which spinal nerve roots pass on their way out to all parts of the body. The enlargement associated with facet joint hypertrophy may encroach on and narrow the foramen. In this case, the nerve material may possibly “bump into” the bone that has been laid down during the arthritic process described above, leading to symptoms of cervical radiculopathy. Cervical radiculopathy is a collection of signs and symptoms related to compression of a spinal nerve root in the neck. Symptoms can include pain and/or electrical sensations that travel down one arm. The facet joints themselves, which are more technically named zygapophyseal joints, are the angled joints located on either side of the bony ring that is in back of the vertebral bodies. Facet joints help stabilize movement of your spine. Their angle and the height of the intervertebral disc located at the same spinal segment determines the parameters of the movement that are allowed at that joint. This means that for each region (i.e., cervical, or neck, thoracic, or upper and mid-back, and lumbar, or low back) the amount of flexibility and the direction in which you can take your spine differs. For example, in the cervical spine the facet joints are angled at about 45 degrees, and allows for movements in all directions. In the thoracic region, which corresponds to your upper and mid-back areas, the facet joints are angled at about 60 degrees. This permits side bending and twisting, but no flexion or extension. And finally, in the lumbar spine, the facet joints are positioned at a 90-degree angle (approximately) allowing for only forward or backward bending of the spine. This, either in addition to or rather than very tight back muscles may contribute to low back inflexibility. A 2017 study published the journal World Neurosurgery found that lumbar facet joint angles are such that they may pre-dispose you to spinal instability, specifically a condition known as isthmic spondylolisthesis. If your facet joint hypertrophy causes you pain or physical disability, you may be wondering about treatment. Many people do quite well by going the conservative route only. This involves seeing a physical therapist, performing prescribed exercises daily and developing good posture habits. If surgery is needed, it may only be to help relieve pain by destroying the tiny nerve ending located in your facet joints. Eroglu, A., et. al. The Role of the Features of Facet Joint Angle in the Development of Isthmic Spondylolisthesis in Young Male Patients with L5-S1 Isthmic Spondylolisthesis. August 2017. https://www.unboundmedicine.com/medline/citation/28549642/The_Role_of_the_Features_of_Facet_Joint_Angle_in_the_Development_of_Isthmic_Spondylolisthesis_in_Young_Male_Patients_with_L5-S1_Isthmic_Spondylolisthesis.